Did you know that a glass ball will bounce higher than a ball of rubber? Or that kangaroos cannot walk backward? (p. 38) You might say that such general knowledge trivia are well, trivial, but Berger does not think so. Professor Berger has set himself the task of discovering what it is that makes some things go viral – why it is that we share certain things but not others. The facts above come from under the Snapple caps. Snapple introduced them in 2002 – sales soared! But why? Berger’s answer is that we love to share things (such as weird facts) because that make us look good – it is a kind of ‘Social currency’. 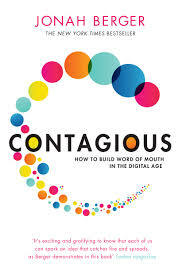 He has identified 6 key ingredients to ‘virality’: Social currency / Triggers / Emotion / Public / Practical value / Stories. There is a great deal here that we can use. Clearly, if students like something enough to share it, that could potentially make excellent teaching material. Strange facts (e.g. the QI books), lateral thinking problems, inspirational quotes can all make great ‘Social currency’. Some elements such as ‘Stories’ or ‘Emotion’ are obvious, but what about ‘Practical value’? Well, I like to give my teenage students diverse reading material but there is one book (‘Body Language’ by Pease) which they almost never return – they buy it off me! Why? Because it says how you can tell if someone likes you. What would happen if we gave our classes more stuff like this? ‘Triggers’ (ch. 2) is a fascinating concept. The idea is that we are more likely to do something if there are things around us that remind us of it – things that ‘trigger’ a particular thought. Berger and Fitzsimons got students to eat 25% more fruit and veggies by using this trick (p. 72). Could we do the same and get our students to study more? OK – I have saved a little puzzle for the end. Q: Imagine you are about to open your Apple notebook which is in front of you. Is the logo the right way up? It should be, right? Wrong! Now open the laptop. That’s right. It is the right way up – for all the others to see! (Public! – p. 127).